Be the first to share your favorite memory, photo or story of Fortuna. This memorial page is dedicated for family, friends and future generations to celebrate the life of their loved one. 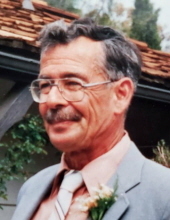 Fortuna Frederick Camin, age 81, passed away peacefully surrounded by loved ones on March 30, 2019. Fred, or Tuny as many people knew him, was born in Mariposa, CA on April 26, 1937. He was second oldest of four children to David and Juanita (Phillips) Camin. Fred was a veteran who served in the United States Air Force. After his service, he worked at Raychem for many years before his entrepreneur spirit drove him to start his own business. Fred was an industrious man who, with the help of his wife Barbara, created a successful landscaping business in 1980. His son, Rick, carries on his legacy running the family business with the help of his son, John. From a young age, Fred had a passion for motorcycles and the freedom of the open road. His favorite activities were traveling down the backroads of California on his Harley, and spending time with his family and friends. He enjoyed hosting gatherings, such as his annual pig roast cookouts and fun theme parties for his grandchildren which included Mickey Mouse pancake breakfasts and ice cream sundaes parties. He also enjoyed net fishing for smelt on the beach, camping and golfing. Fred is survived by his loving family Barbara Anne Camin; children: Tony Camin (wife Carol), Todd Townzen (wife Mary Jo), Mark Camin (wife Kathy), Rick Camin (wife Marina), Troy Townzen (wife Karrie), and Nicole Ambrose (husband Bart); grandchildren: Dana, Andrea, Calvin, John, Ryan (wife Katie), Troy (wife Amira), Samantha, Brooke, Matthew; and great-grandchildren: Charlie and Payton, plus another boy on the way. The family will celebrate Tuny’s life privately on Sunday after his 82th birthday, April 28, 2019. If you are interested in attending please email Nicole Ambrose at ncamin@yahoo.com. We want to thank Elvie, the owner of his care home Monte Farley Manor, and her staff for their wonderful care of our father. We suggest that any desired donations be sent to Monte Farley Manor, 579 Farley Street, Mountain View, CA 94043. To plant a tree in memory of Fortuna Frederick Camin, please visit our Tribute Store. "Email Address" would like to share the life celebration of Fortuna Frederick Camin. Click on the "link" to go to share a favorite memory or leave a condolence message for the family.